Optimize and refine your Facebook posts when sharing a URL. URLs might be blog stories, news stories or any other shared content that is hosted on another website. 1. Create a shortened URL on Bitly to track the clicks on your post. 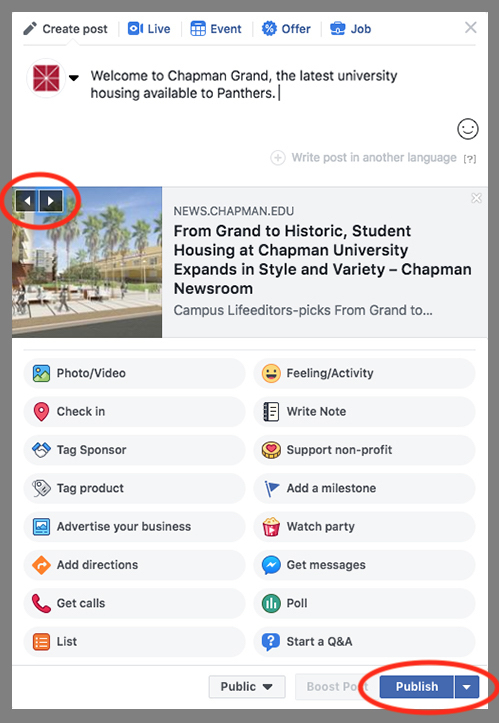 Create a free account on bitly.com and paste your Chapman URL in the “Generate” box. 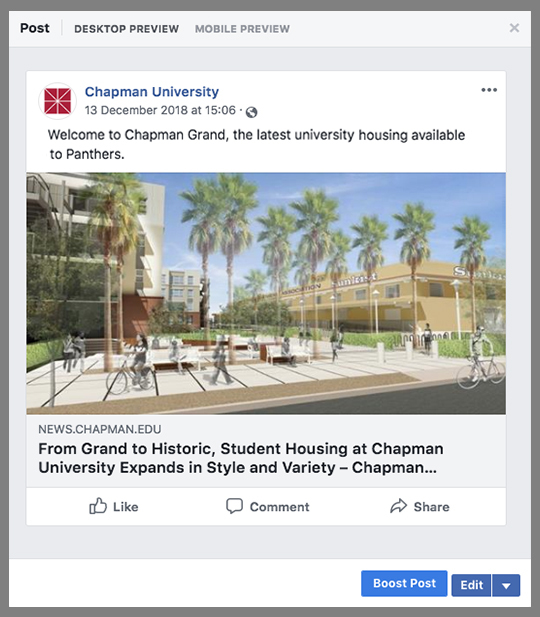 Chapman University has a branded URL with bitly so all Chapman blogs and webpages will automatically have the branded URL of chapma.nu followed by the generated code at the end. Bit.ly is an excellent tool for extra analytics as it allows you to monitor clicks on the shortened link which will give added insight to what followers engage with. 2. Paste the shortened URL into the content box. 3. Remove the URL and replace it with unique copy. Once the link is posted and the preview is generated, the URL can and should be removed. Posts will look cleaner and more user friendly without the link visible. You can now add your copy for the post. 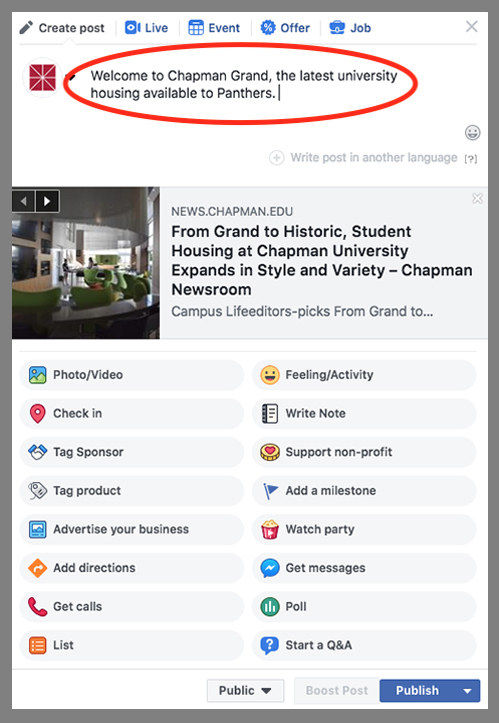 Captions should give the users a brief, catchy bit of the information that will encourage them to click on the link to read more. 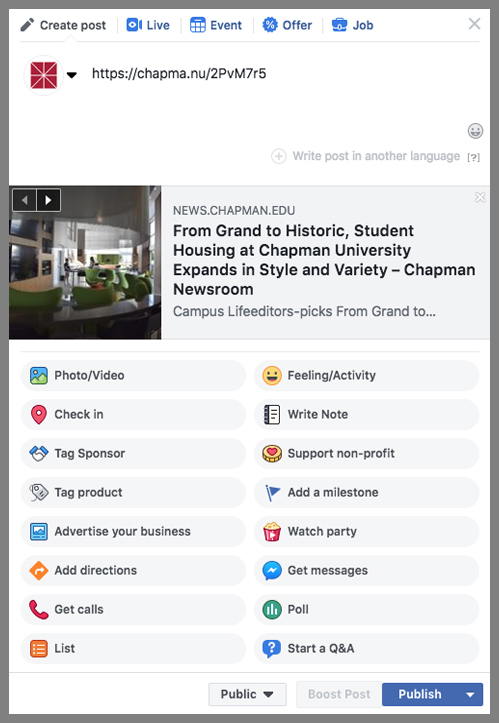 Facebook has removed the feature allowing users to upload a new image to replace the image pulled from the blog post or webpage. This means that blog posts should ideally include images that will work on both platforms. In some cases, blog posts or webpages may have multiple photos that get pulled in by Facebook. In this case, you will see clickable arrows on the image in the link preview. You will be able to click through the available images and choose a photo that will best represent the blog post. Once the image has been selected, you should be ready to schedule your post.